Des Moines, Iowa - After being unable to play over the past two days due to inclement weather in the upper Midwest, the Oklahoma City Dodgers returned to game action Saturday and split a doubleheader with the Iowa Cubs at Principal Park, taking the first game, 3-0, but falling, 2-1, in the second game. In Game 1, the pitching duo of Tony Gonsolin and Zach McAllister combined on a three-hit shutout, guiding the way to the 3-0 victory. Gonsolin and McAllister yielded three singles throughout the game and held the I-Cubs 0-for-14 with runners on base. Iowa only had three runners reach scoring position and none advance to third base. After taking the loss in his Triple-A debut, Gonsolin (1-1) turned in five scoreless frames in his second start of the season. He allowed just a pair of singles to go along with three walks and four strikeouts. When the I-Cubs reached, Gonsolin kept them 0-for-9 with runners on base and only had one runner advance as far as second base. McAllister followed Gonsolin and held Iowa scoreless over the final two innings. He allowed one hit with three strikeouts, earning his second save of the season. All of the game's runs occurred in the top of the third inning. Errol Robinson drew a leadoff walk and moved into scoring position following a sacrifice bunt by Gonsolin. Daniel Castro came up next and lined a RBI single to left field, giving the Dodgers the lead. Two batters later, Will Smith connected on a two-run homer to center field for his second home run of the season to extend the lead to 3-0. The Dodgers (4-5) missed a chance to further build on the lead in the fourth inning. OKC loaded the bases with none out, but Gonsolin grounded into a force out at home, Castro popped out and Matt Beaty flew out to right field. It turned out the Dodgers didn't need the extra offense. Only once after the Dodgers went up 3-0 did Iowa have the tying run at the plate, and they never brought the tying run to the plate after the third inning. Iowa starting pitcher Matt Swarmer (1-1) took the loss after giving up three runs and five hits over four innings. He walked three and struck out two. In Game 2, each team scored in the second inning. The Dodgers benefited from a throwing error by Iowa second baseman Vimael Mcahin while attempting to turn a double play, allowing Josh Thole to score. But on the first pitch of the bottom of the inning, Iowa evened things with a solo home run by Trent Giambrone. Neither team put together a considerable threat to break the tie until the fifth inning. With two runners on and two out, Beaty lined a single to right field. Although the runners ahead of him were stopped, Beaty took a wide turn around first base. After Beaty was briefly in a rundown, the lead runner, pitcher Daniel Corcino, took off for home plate, where he was tagged out. Iowa (6-3) took its first lead of the day in the bottom of the sixth. The I-Cubs had the bases empty with two outs before a single and a walk put two runners aboard. Donnie Dewees then put Iowa in front with a RBI single. Prior to Dewees' key hit, the I-Cubs had been 0-for-17 with runners on base across both games of the doubleheader. The Dodgers almost answered with a run of their own after having the bases empty with two outs in the top of the seventh inning. Down to the team's final strike, Castro lined a double to left-center field to keep the game alive. Beaty and Drew Jackson each followed with walks, but Iowa reliever Rowan Wick struck out Edwin Ríos on three pitches to end the game. The Dodgers left nine runners on base in each game Saturday, including seven over the final three innings of the nightcap. The team went just 2-for-16 with runners in scoring position between both games. Iowa starting pitcher Colin Rea delivered six strong innings and earned the win. Rea (1-0) allowed one unearned run and five hits, with three walks and five strikeouts. Wick navigated the jam in the seventh to earn his first save. 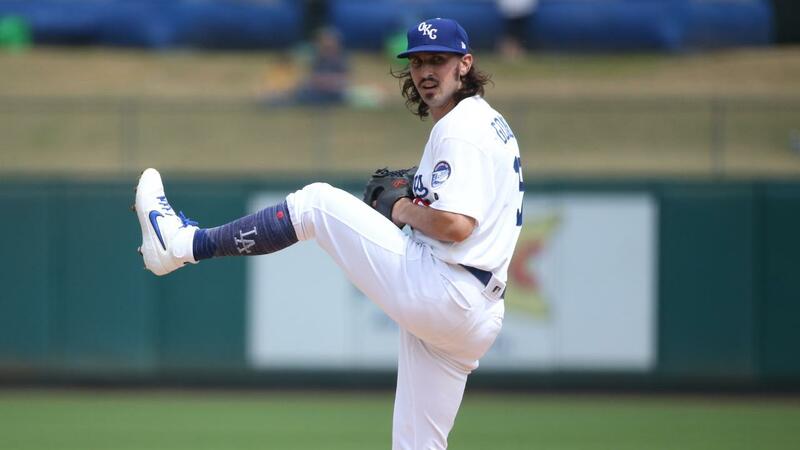 Dodgers reliever Kevin Quackenbush (1-1) pitched the final two innings for OKC and took the loss. He allowed one run and two hits, with one walk and two strikeouts. Corcino gave OKC four solid innings of one-run ball, but he was pulled from the game prior to the bottom of the fifth inning after he was hit in his helmet with a pitch while batting in the top of the frame. Corcino scattered three hits, walked two and notched seven strikeouts for a second consecutive start. The Dodgers and I-Cubs meet next Sunday afternoon at 1:08 p.m. Live radio coverage of each game begins 15 minutes before first pitch on AM 1340 "The Game," 1340thegame.com and through the free iHeartRadio or MiLB First Pitch apps.